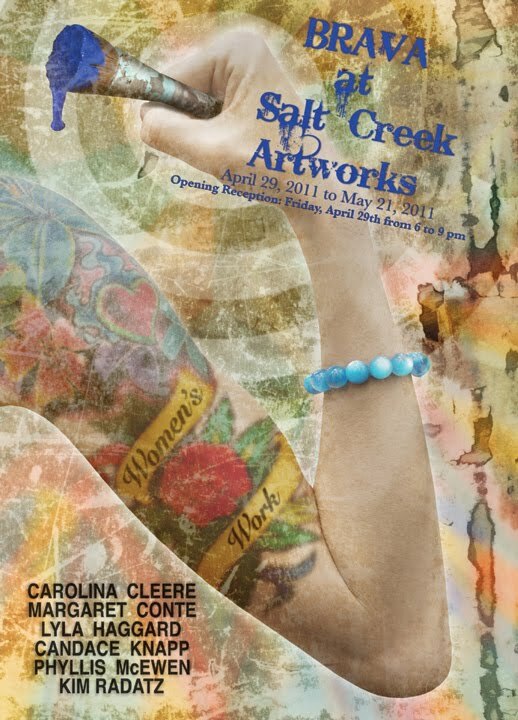 A group of women artists in Florida's Tampa Bay area, dedicated to the stirring up of the status quo! Kim Radatz is in last minute preparation for the opening of her solo show at Salt Creek Artworks in St. Petersburg Friday, March 14th. You can read all about it here in Art Squeeze. I've had a sneak preview and this show is not to be missed. I'm not just saying that because she's my friend. It is an amazing show. So get yourself moving Friday and just get there! Candace Knapp and Martha Marshall will be part of "Irreconcilable Differences" billed as "The Art Show of the Year" opening September 29th at Carmine's, Club Zion, and The World Famous Kick's in Ybor City. This is one of many underground shows produced throughout the year by a vibrant collective of artists in the Tampa Bay area. You can read more about this exciting event on their MySpace page. Shows such as this promise to shake up the Bay Area art scene, which is seriously in need of shaking. Coming up in November, which will include all of the Brava group, is Gala Corina. More about that in a future post! Largo, FL – Gallery O and The Women of BRAVA invite you to attend our opening at 6 PM at Gallery O at 720 9TH AV SW in Largo to see a beautiful, eclectic array of color, style and diverse mediums from Lyla Haggard, Margret Conte, Kim Radatz, and Martha Marshall. Lyla L. Haggard is a lifelong artist who delayed her true passion to make a living in the corporate world of health care for twenty-five years. In time, the artist in her demanded to be set free. She now resides in Tampa, FL, and focuses on sculpture, painting and other fine art disciplines. Margaret Conte has been a working artist for many years. A Tampa, Florida, native, she studied at Hillsborough Community College, University of South Florida and Penland School of Crafts in Penland, North Carolina. 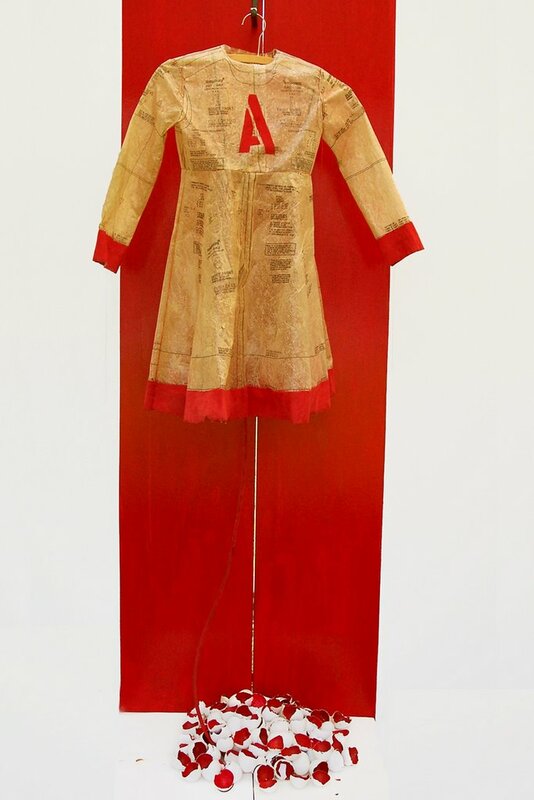 Her work is in collections in Russia, Japan, Canada, South America, and the United States. Kim Radatz holds a Master's Degree in Fine Arts from the University of Miami , Coral Gables , FL where she earned a degree in sculpture. After graduation, Radatz taught at both Florida International University and the University of Miami as an adjunct professor. She moved from Miami to the Tampa Bay area in 1998 and has since been a full time studio artist. She won the Best of Show Award in the 2006 Gasparilla Festival of the Arts. Martha Marshall paints full time from her studio in Valrico, Florida. Her work has been featured in numerous gallery shows from Washington DC to southern most tip of Florida. In 2003, one of Marshall’s paintings was chosen for use in the motion picture "The Punisher," filmed in the Tampa Bay area and released in 2004. Marshall’s works can be found in many major collections, both private and corporate, throughout the United States. If there is a Brandon area arts scene, it has been difficult to find at times. But suddenly, in the past few months, there seem to be signs of life. Artists and arts supporters are beginning to come together and stir things up here and there, and our recent BRAVA-sponsored Slide Slam and JPEG Jam was just one example of that. Artists attended from as far away as St. Petersburg and Tampa Palms, but many were also from right here in Brandon. Click here for an excellent article by columnist Ernest Hooper of the St. Petersburg Times, who attended the event and interviewed BRAVA's Candace Knapp and Martha Marshall. This article also has information and links about the newly formed steering committee of the Arts Council of Hillsborough County, which will investigate the community's interest in having an arts facility for Brandon. Attention Artists and Art Lovers in the Tampa Bay Area: BRAVA is sponsoring a slide slam and jpeg jam, a gathering for artists, collectors, and all who enjoy art, Sunday May 7th from 7-9 p.m. at O’Brien’s Irish Pub at Kings and Lumsden in Brandon, 701 Lumsden Road West. Artists are invited to bring up to 7 slides or digital images to show your work and share your thoughts and ideas. Artists who do not wish to show their work will still enjoy a fun evening meeting other artists in an artist-friendly environment. If you want to bring jpegs, please bring a CD-R with images no larger than 72 dpi and a maximum of 768 x 1024 pixels. Contact any Brava member by following our links here for more information. Kim Radatz Wins Best of Show at Gasparilla! Congratulations to BRAVA member Kim Radatz who just walked away with the $15,000 Best of Show award at Tampa's prestigious Gasparilla Festival of the Arts! Although this linked article in the St. Pete Times implies that this is Kim's first juried competition, it is far from that, as evidenced by previous articles on this blog. She has numerous awards from past shows. But Gasparilla is a biggie, and now doors will be opening for her everywhere! We are all so happy for her. 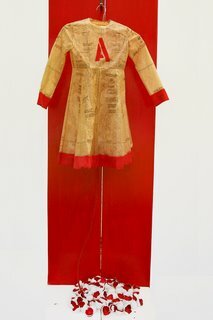 The winning mixed media piece is shown here, titled "The Scarlet Letter." 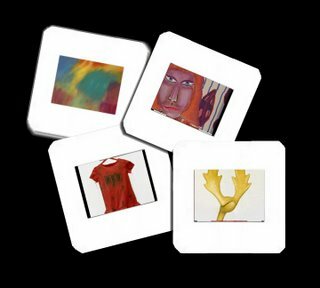 Kim's Blog: "Thinking Out Loud"
Martha's Blog: "An Artist's Journal"
Phyllis McEwen's Blog: "Don't Get Me Started"